I hope everyone is enjoying a relaxing weekend. I wanted to share with you the cotton canvas version of an earlier post, “Reflections”, which was done on canvas paper. 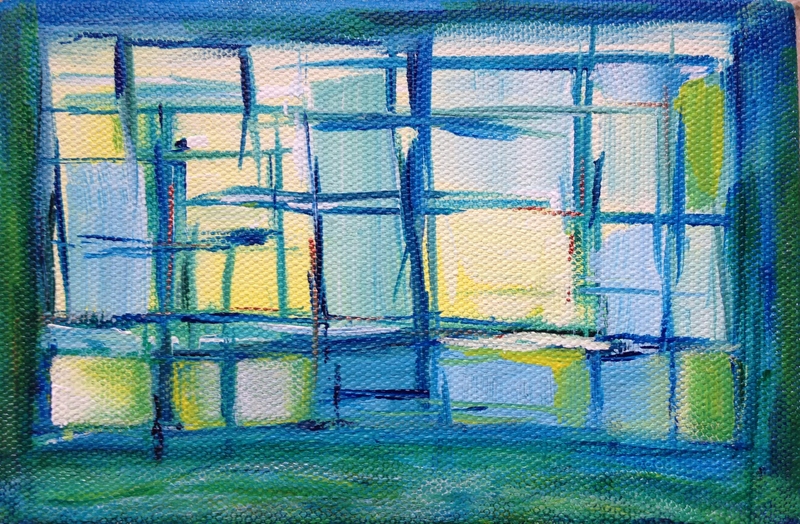 This one is acrylic on 4 x 6″ wrapped cotton canvas. For the month of May, I’m planning to join my very talented and versatile artist friend Margaret Parker Brown at Yuba Gold in posting a painting every day. Not sure if time will allow each day, may have to set an alarm for 5:30 each morning to make this happen! Looking forward to the challenge. My goal for this month is to work larger, and to eventually paint something realistic in acrylics. We’ll see what happens. Peace & paint puddles to people from pole to pole! Another beauty! I think I see an eye peeking through one pane and a mouth through another. I love the light of the yellow and white. Can’t wait for your daily art!!! YIPPEEE!! This is fabulous on canvas!! I really think you’ve struck on something wonderful here. I’ve been loving these and this one is equally luminous and amazing. Beautiful sis! 💜😍And thanks for the link to Margaret… lovely work… I wasn’t following her yet! beautiful soft mellow butter yellows with those blues and greens… very nice palette. Your paintings Still look much larger, Laura, than 4×6 inches, that is for sure. it is a difficult task to make a very small painting Appear as if it was much bigger!! yes, web people. they will, take images. and use them. its The Problem with the web. once our stuff in online…. it is out there. and people will copy/plagiarize thinking its “ok” to copy ART, but not music, or a novel, or a medical breakthrough. How exciting for all of us, nothing can stop us now….well actually a lot can but we are going to be positive and trust the process and go for it! What is there to lose? Blessings! Margaret, we can do it! *waves pompoms* I am so excited to see where this challenge takes both of us! Great colors! It makes me think of the sea! I guess that’s what you meant by thinking about water? OH MY GOSH, what a challenge! Best of luck and I look forward to seeing your daily painting. I hope you manage it too, but don’t get up to early, lol love the idea, and the going big. Thank you so much! I really appreciate you stopping by and letting me know that. I so enjoy painting abstractly. I find that, for me, it is a way to translate my feelings directly to paper/canvas without anything getting in the way. Again, thank you for your kind comment. It means more than you know. That is quite a challenge! I’m a night owl, so 5:30 sounds really early to me even though I do have to be up by 6:00 two days a week. 🙂 Good luck! It’s really early to me, too, believe me! We’ll see how it goes…..definitely need to get to sleep sooner. And hopefully sleep more soundly lol. Lately I have been staying up until between 11 p.m.and 1 a.m. and getting up by 6! My daughter only has 4 more weeks of school so then I can relax when I don’t have to get up to drive her to town for classes four days a week! 🙂 I’m looking forward to school being out. Painting a day challenges are such fun! And you learn so much. Looking forward to seeing what you and Margaret get up to!